Since having my eyes opened to the very large (and funny!) comedy scene in Saint John – I haven’t been able to escape the advertisements for show after show, weekend after weekend of comedy. I met Shane at a new material night at Happinez Wine Bar a few months ago. 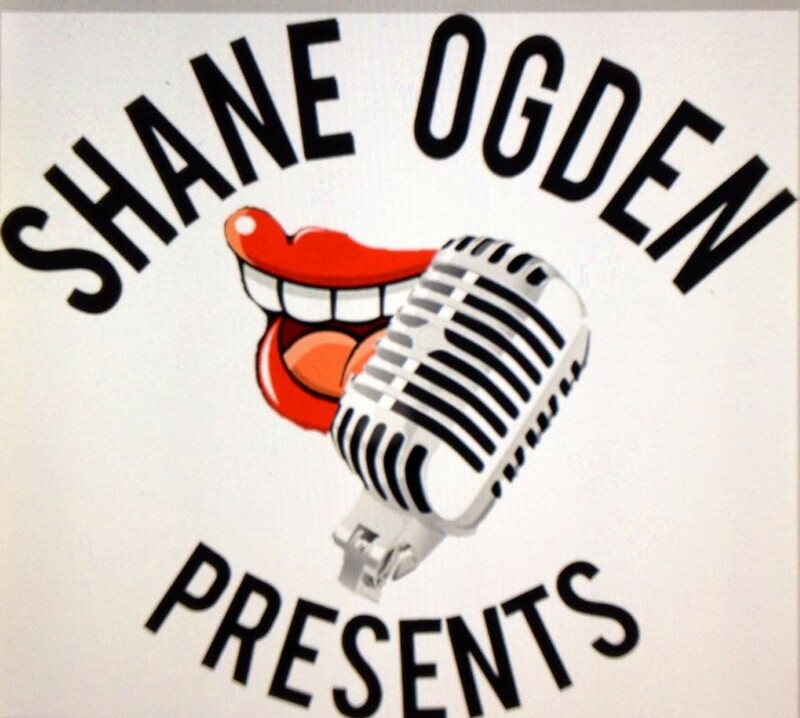 He told me about his regular comedy series, Shane Ogden Presents and naturally, I wanted to share with you. 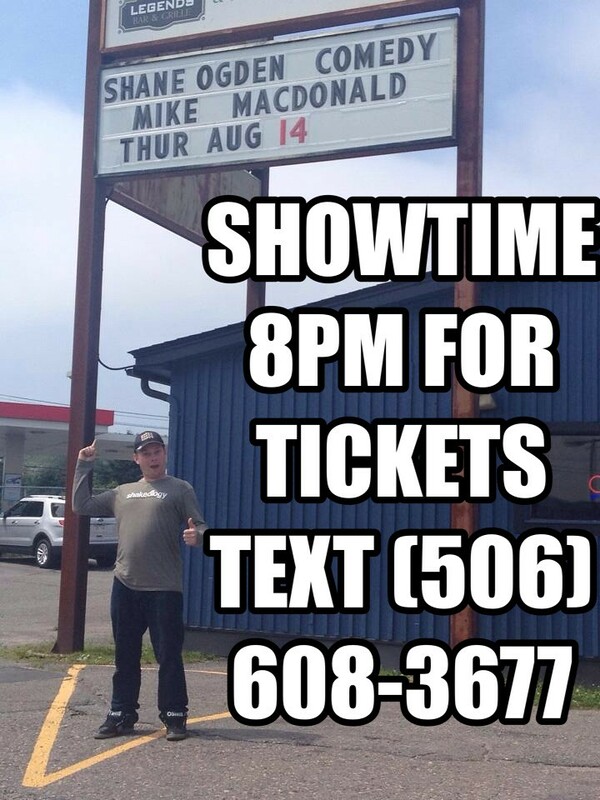 The next Shane Ogden Presents… show is August 14th in Saint John at 3 Miles’ Function Junction and features Comedy Legend Mike Macdonald. Tickets are $20 and $5 off of every ticket goes to the RCMP Foundation. I think my favourite thing about SOP is how personal it is – you can text (506) 608-3677 for FREE ticket delivery anywhere in the Saint John area by a real human! You don’t even need to leave your couch! Hi Shane! Tell me about yourself and what you do. I’m a father, comedian, and electrician. I assume you are asking about comedy.. I’m 38 and I’m still learning who I am. I’m certainly not who I thought I was going to be… I’m sure I’ll be a couple of more things before I die. How did you get started in comedy? Do you remember your first “bit”? I was in a couple of plays in High School, when I graduated I went to Calgary, where I continued to act in community plays and a travelling Dinner Theatre Group. 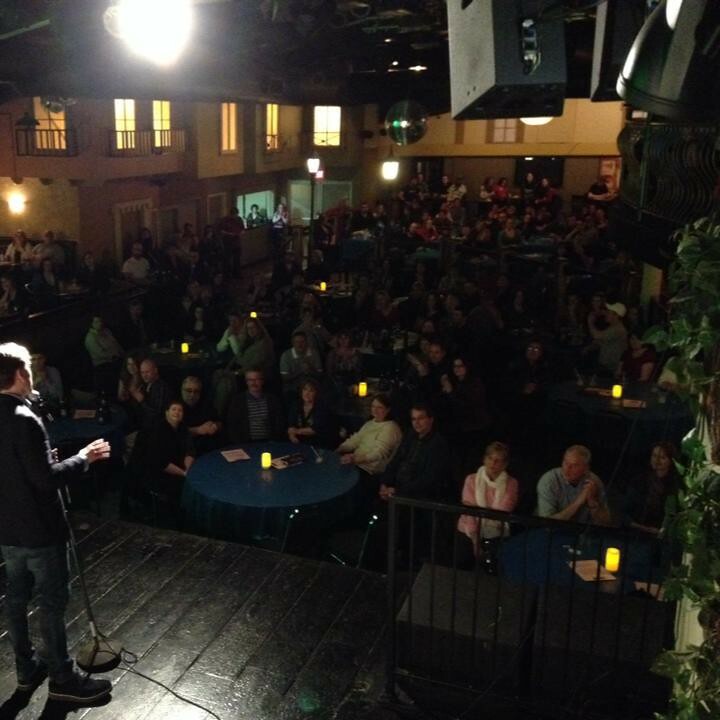 After one of these plays our cast party was at a comedy club, and I decided I had to try stand up. It looked like a lot of fun. I’m understating that, I was in an obsessive trance. I knew I was going to do it for the rest of my life. My first “routine” was about air travel… I am to embarrassed to even repeat it, lol. I will say I wasn’t good right away… for every good bit I’ve had I’ve made 10 peoples’ ears bleed with failed attempts. I have gone through a lot of different phases and have taken several different approaches to stand up. I’m currently in my favourite headspace which is a clinically depressed terrible parent with O.C.D. Seems like the more problems you have the funnier it is to people. Human beings are really awful, terrible creatures, lol. James Mullinger performing at Shane Ogden Presents! 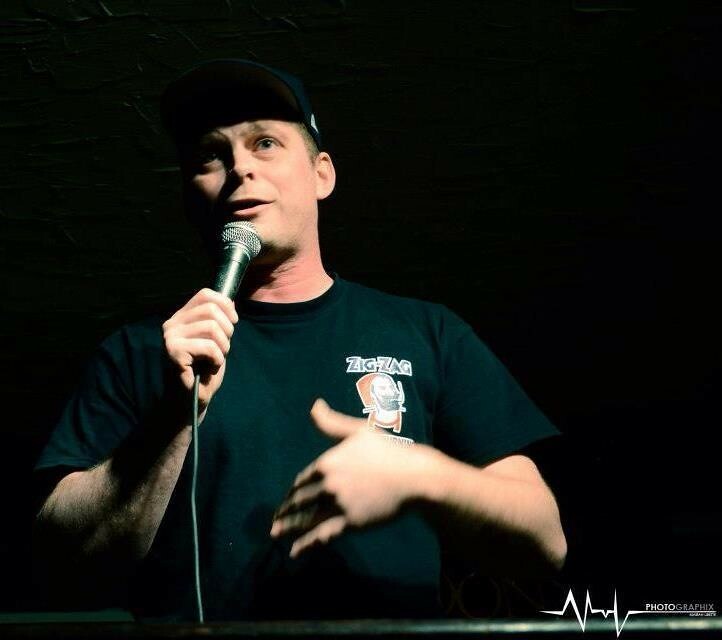 Comedy in Saint John is not new – but it seems like it’s gone through some sort of rebirth or new identity. Enlighten me on Comedy in SJ. Tell me about Shane Ogden Presents! This series is regularly sold out and is not a money maker for me, it’s about high quality entertainment at affordable prices. My regular shows are just ten dollars, and feature comedians who are not household names, but have amazing comedic abilities. I make only enough to generously pay the performers, no agency fees, no middle men, just production costs, equipment rental, and laughter. I also hire local comedians and give them opportunities to be part of a professional show. Even before me there was also Lloyd Ravn, who has taken a brake to care for his family. He put on loads of regular shows at great expense and definitely made a huge impact. Then there is the pure magic of James Mullinger, whose enthusiasm is matched only by his tremendous comedic talent. He is currently setting up shows all over New Brunswick, and is making great things happen. Between Lloyd, James and myself we’re the reason there are regular, professional stand up comedy shows in Saint John… and all of NB. Mike Macdonald, Derrick Edwards, Mike Wilmot, Tom Stade, Pete Zedlacher, Brett Martin, Debra Digiovanni, Mark Little, Sean Lecomber, and Paul Myrehaug. All amazing under appreciated Canadian artists, all among the best period. If I were to put a dream team Canadian Olympic Stand Up Comedy Team, that’d be it. There are so many great talents, and Canada has the best Comedians in the world and because I love stand up so much I feel it’s my mission to make sure people know their names. What’s a typical day like for you / what is your dream day? I don’t know how typical my days are… but generally I wake up waaaay to early to go to a job far away from my home… the day is usually broken up and peppered with thoughts of missing my family, a new bit I’m working on, or how I’m going to pay for the next “Shane Ogden Presents…” Show. My dream day would be sleeping all day, waking only to play with my kids, write for an hour on a shaded balcony, perform at a regular open mic, see all my friends, and then I can’t tell you how my day would end except to say it would involve illegal substances, my wife and things she won’t even do on my birthday. Next I will focus on loving my family and friends, writing and performing stand up, and making “Shane Ogden Presents…” the best it can be by providing quality entertainment at affordable prices. 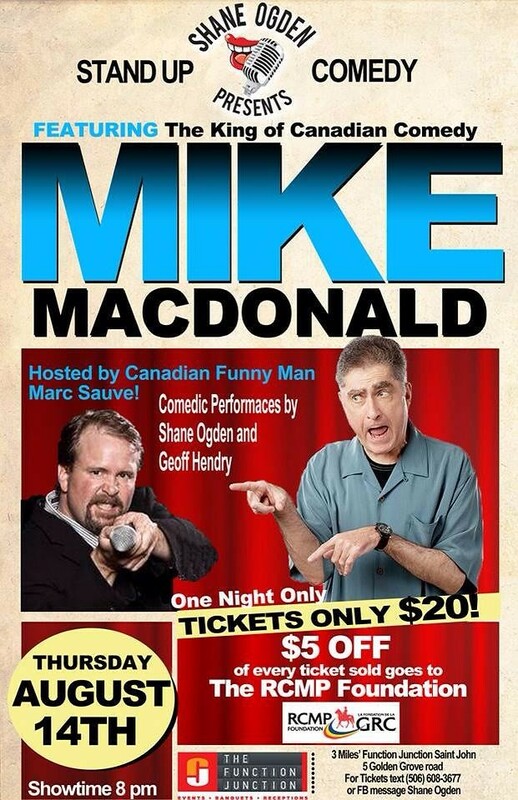 The next “Shane Ogden Presents…” show is August 14th in Saint John at 3 Miles’ Function Junction and features Comedy Legend Mike Macdonald. Tickets are $20 and $5 off of every ticket goes to the RCMP Foundation. Text (506) 608-3677 for FREE ticket delivery anywhere in the Saint John area.